Are you looking for something new and exciting to do with your loved one? 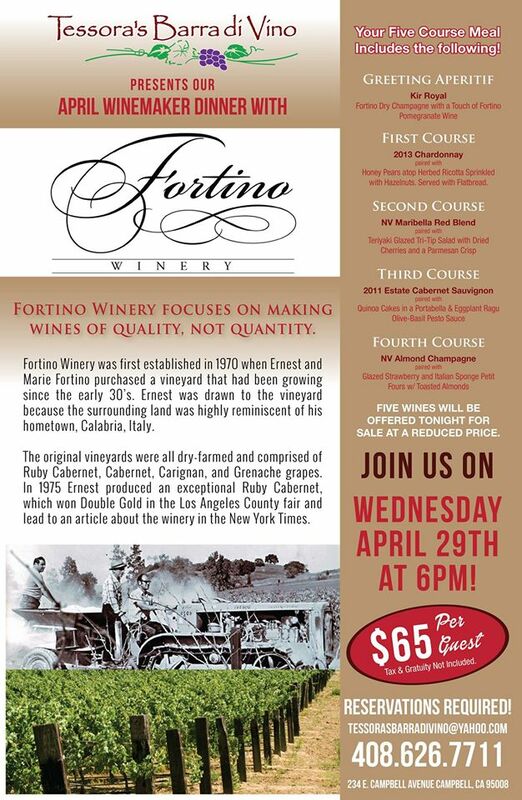 APRIL WINEMAKER DINNER WITH FORTINO WINERY. This night will be filled with 5 wonderful wines perfectly paired with a 4 course meal you surely won’t want to miss out on. Honey Pears atop Herbed Ricotta sprinkled with Hazelnuts served with flat bread. If you like what you are seeing so far, you are definitely in for a great night with your loved one. Remember that this event fills up fast, so act now and get your reservation today! Have a great Easter weekend from all of us at Tessora’s, we look forward to seeing you soon.